At the end of the first age, whoever has the most tokens in a region scores the glory shown on the first token. After the second age, the players with the most and second most tokens score glory equal to the values shown on the first and second tokens respectively. Players score similarly after the third age, then whoever has the most glory wins. (Games with two and three players last only two ages). Two to six players will compete to become the next Lord of Ethnos. To do so, you must earn more Glory (victory points) than your rivals by controlling the Kingdoms on the game board and recruiting the most Allies. You will accomplish your goals by collecting scattered members of the 12 Tribes, represented in the game by cards, and playing them in Bands to gain control over the Kingdoms. Each of the 12 Tribes has its own unique ability. 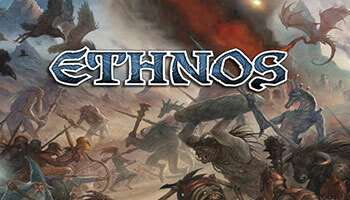 Use their abilities wisely and you will soon be the new Lord of Ethnos! Remember that only the Leader of a Band of Allies is allowed to use its ability. Always swift on their hooves, the Tribe of Centaurs is a group of proud warriors that roam the land far and wide. Many enemies have fallen prey to their wellcoordinated surprise attacks.